It was Christmas. No wait, it was Easter. Actually, I was away on holidays. And I’d had kind of a stressful day! Okay, so I admit it – it was a bit of a reward. I’d been so good, after all – I deserved it! And I was just a little emotional. Besides, it was nearly out of date and so it had to be eaten. Waste not want not. AND, what I nearly forgot to say was it had been a gift – it would have been incredibly rude to miss out on getting to enjoy it. Okay, okay, so it was somewhere between Christmas and Easter and I may or may not have been on holidays. It’s possible I was stressed but maybe not in a ‘have to eat chocolate or will kill someone’ sort of way, and it’s probable that I was emotional about something which I may or may not have been rewarding myself for handling nicely. I lied about it being nearly out of date, and as for whether it was a gift? I don’t really remember, but who cares! What is absolutely 110% definite is that it was delicious. Just try and prove me wrong on THAT why don’t you?! Besides, what’s the big deal anyway? It’s a girl thing. You know – everybody’s doing it. Let’s just get this right on out in the open from the get go. I’m a chocoholic, and I’m not ashamed to admit it. Just yesterday I had 3 full boxes of Loving Earth’s new raw chocolate bars (the mini ones) delivered. That stuff is amazing. They’ve replaced the agave with evaporated coconut nectar, which is much lower GI and MUCH lower fructose but hey – still sugar when all is said and done. Delicious sugar. Don’t worry. I haven’t cleaned out the whole 3 boxes yet. I restrained myself to lying on the trampoline last night once all my work was done and enjoying one mini heart shaped Coconut Mylk (yes mylk) bar. Not just the actual chocolate itself, but the whole experience. I’d had a super productive day at writing and business-y stuff and training and being a Mum and doing errands, and it felt great to reward myself. And I most definitely do use chocolate as a reward. Many days of the week, in fact. But there’s a difference between a carefully enjoyed reward of 35 grams of raw chocolate and a stress or emotional or boredom response binging session of an entire block/bag/basket/confectionery aisle of so-called milky goodness. Even if it is good quality raw dark mylky goodness. And I know that you know the difference I’m talking about. Here is what I suggest. I think (firstly) that we all need to man up and admit that we have superhuman capabilities beyond what men will ever possibly understand and that we are indeed capable of eating a whole block of chocolate at once if we so desire. And even if we don’t especially so desire but just seem to be compelled to do so. A couple of years back a friend of mine wondered to me in genuine astonishment at his girlfriend’s ability to eat an entire packet of Tim Tams. Despite being a big muscle-bound male with plenty of energy-burning ability he just couldn’t understand how that was possible. Didn’t she get full? Didn’t her stomach start hurting? Didn’t all the sugar slow her down. Getting full isn’t the point! Sugar rushing is irrelevant! Regret before the last morsels have been carefully swept off your teeth is so passe. The point, as we all know, is that we can. And sometimes we really really really (feel) we need to. Besides, chocolate is very healthy for women! And no, we don’t need to be reminded that that particular fact applies not only to quality but also (ahem) quantity. Of course just in case you do need a reminder for some as yet unforeseen future point, here are my tips. 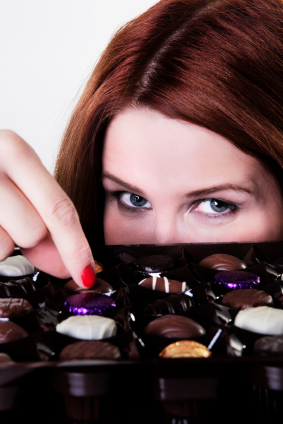 Here are my tips for being a sane chocoholic and feeling great about yourself. Quality. It goes without saying that Cadbury Dairy Milk is not good chocolate in the same sense as raw chocolate is, or even Green & Blacks Organic. If you love love love some cheaper milky chocolate now and then then for the love of God only buy it now and then. In a Freddo Frog sized quantity. Don’t even begin to try and kid yourself that you’ll savour that block of Marble or Top Deck over a few weeks. Really. It’s shameful that you’d even think of trying to pretend such a thing. Set yourself up for nutritional success. Massive chocolate or sugar binge sessions don’t happen because a block of the stuff accidentally fell into your mouth. Set yourself up for nutritional success by eating clean lean protein, greens and good fats from early in the day and every few hours as you go. The Woman Incredible Look Great Naked Eating Plan can show you how to do that and still enjoy your treats without feeling bad about it. Delay gratification – this is my friend Rachel. She trains with the same trainer I do, Daine from Clean Health in Sydney. Daine and Rach are both fellow Poliquin professionals. Know your triggers. Simple, obvious, but oh so easy to fail at. Keep your trigger foods out of the house for heavens sakes! Always! See the rule on Freddo Frogs above. Also – know your stress triggers. What sets you off? I know that after a crazy busy over-scheduled day I feel as though I need completely private me-time for at least 10 minutes when I get home. When I was suffering with bulimia that me-time would involve eating up to 3 or 4 blocks of chocolate. Yes, in 10 minutes. After that I do usually have some chocolate, but in a sane way. And I enjoy it. Consciously. If you just need to get the stress OUT and fast, eating will NOT truly do it. You’ll push the stress down by eating; internalise it. Something else that works really well for me is fast journalling, just letting it all come out. It’s going to be Easter soon. I’m going away on holidays. I’ll probably be a little stressed as I have a new book coming out just after Easter and I always cut things super close. I’m sure I’ll get some gifts of chocolate as well. So really, I have a ton of good reasons to stuff my face with chocolate.